Part number BMINI-365 is an ultra-portable mini UV flashlight working with one AAA battery and BATTERY INCLUDED! Comes with the key chain, it is convenient for carrying. "This small UV light was perfect for checking ID's at our event last March. A must have if you deal with validating driver's licenses and IDs. Thank you Risk Reactor!" When you are in the market for a black light you want maximum effect from your UV light source. Most black light reactive materials use the long wave 365 NM wavelength. This UV light source has low apparent visible light noise. Giving the reactive surface a greater difference visually then using a higher wavelength. Now with that being said there are some materials that need 395 NM. But generally speaking the 365 NM wavelength ensures the fluorescent object, and not the surrounding surface, is illuminated perfectly. 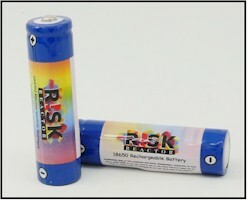 Risk Reactor Inc.’s 365 NM ultraviolet light produces a near pure black light output which is the best frequency for typical UV fluorescent applications. This powerful and high quality portable black light flashlight is perfect for many uses including checking antiques, looking for pet stains, checking driver's licenses and money, locating scorpions, forensics, or lighting up your fluorescent and many other black light reactive items. Switch: mechanical revolving head switch. Reflector: High temperature vacuum coated aluminum mirror reflector. "The best quality black light in a small package. We love this flashlight for checking ID's at all of our night clubs. The key chain helps it not get lost by the staff."